If you are looking for some of the most spectacular natural attractions Costa Rica has to offer, don’t pass up a chance to visit Monteverde. Located near some of the country’s acclaimed cloud forests, Monteverde has been named one of the country’s seven wonders and has become a major tourist draw despite its remote location and difficult access. The town of Monteverde itself remains mainly rural, although it now has tourist-friendly features such as a bank and ATM machine, as well as Internet cafes, supermarkets, restaurants and bars. The most popular attraction in the Monteverde area is undoubtedly the Cloud Forest Biological Reserve, which is visited by some 70,000 tourists annually. The cloud cover that shrouds the forest is due to the area’s higher elevation, and the increased humidity this brings. The nature reserve is home to 400 species of birds, 1,500 species of reptiles and amphibians, 2,000 species of trees and plants and 100 species of mammals. 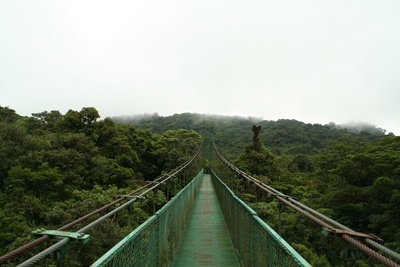 The most popular way to explore the cloud forest is through a canopy tour where tourists walk across a network of elevated bridges from where they can enjoy a bird’s-eye view, although there are also many excellent trails for hikers. Tourists used to Costa Rica’s temperate climate should not forget to bring some warm clothes, as the weather can be quite chilly. Since Monteverde is a dairy producing community, visitors should not forget to sample some of the delicious local cheeses. You can also do some souvenir hunting at the local craft markets or the co-op center, and visit the Hummingbird Gallery or butterfly garden.